The Washington State Animal Response Team (WASART) is a 501(c)(3) nonprofit all-volunteer organization that helps companion animals and livestock out of immediate crisis and dangerous situations. WASART is trained to help in situations such as if your horse is trapped in a well, your dog falls over a cliff, or your community needs help sheltering animals for short-term issues, like threat of fire. WASART does not self-deploy, and the team must be called out by an owner or an agency, such as the fire department, sheriff’s office, or emergency management. We respond to disaster and emergency situations involving all domesticated livestock and companion animals. We are not trained to handle wildlife or exotic species. During Hurricane Katrina, a third of New Orleans residents refused to evacuate. One third of those individuals refused to leave because they could not take their pets with them. One particular story affected founders Gretchen McCallum and Greta Cook, about a boy having to leave behind his little dog, Snowball. Determined that what happened in New Orleans should not happen in Washington State, McCallum and Cook decided to do something about it. They were veterans of other volunteer search and rescue organizations, such as Northwest Horseback SAR, and in early 2007, McCallum and Cook founded WASART. The first callout came shortly thereafter. The newly formed team received a phone call from Dr. Heather Stewart, VMD. She was on-site with a mare who had been downed in mud for two or three days in a pasture on private land. Dr. Heather and the animal control officer at the scene were unable to get the mare to her feet and requested WASART’s assistance. Founders Gretchen McCallum and Greta Cook, along with other early members of WASART, were on scene within 40 minutes. 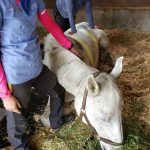 Using rope, tarp, and a 4-inch fire hose, as well as makeshift equipment from the site, they retrieved the mare from the mud, offering her warmth and protection as they overcame every obstacle and challenge to get the horse to proper medical care. Ultimately, the horse did not survive—not every rescue has a happy ending—but WASART was truly born.